Crawling its way from old media hell is "Slashback Video." In the vein of the Everything is Terrible having a rental store that only carried Jerry Maguire we're getting another VHS store art installation, except this time, it makes more sense. 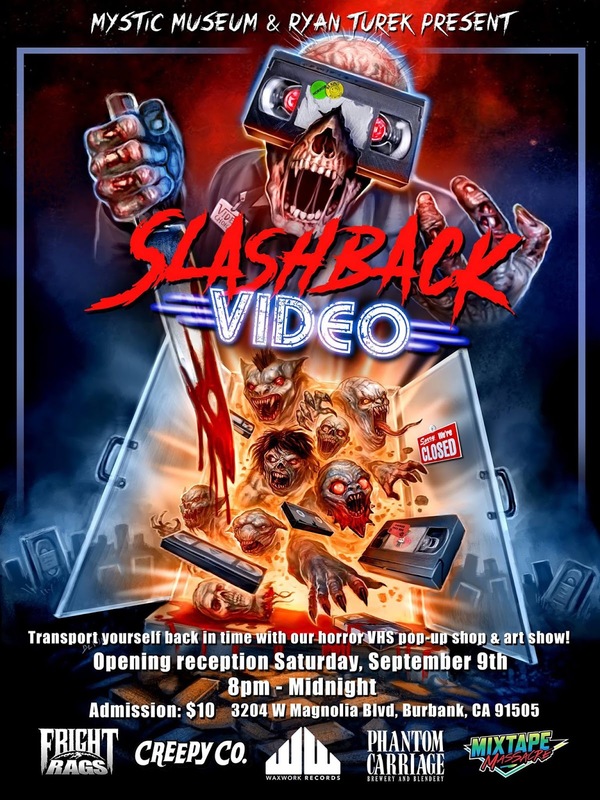 Slashback Video is celebrating picking up horror movies like in the days of yore, before Netflix and Hulu. Back in a time when you had to search the shelves and choose what to watch based on box art and recommendations from the staff. Now, sadly, you won't really be able to rent any of the VHS copies, but you will be able to browse them. Feel the weight of videos in your hands and check out the great box art. Now some of that box art will be brand new. Artists from all around will be getting cases to mock up as they please. So you'll have new art pieces that you can procure while looking around at what it was like to get your horror movie night on. On top of that you'll be given an empty VHS case that you will have to drop off in the return basket, that's your ticket for entry. Now it's starting Sept 9, but don't worry, it'll be around into October, so you'll have plenty of chances to check it out. 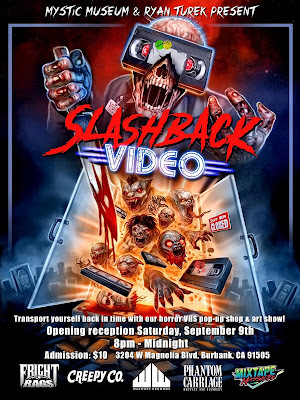 Come to the opening reception of Slashback Video - an ode to the VHS days of horror that's one part pop-up shop and one part art installation. Step back in time to the 1980s when mom and pop video stores thrived and gaze upon a wide array of posters, VHS tapes, promos and more. Brought to you by Mixtape Massacre, Creepy Co., FRIGHT-RAGS, Waxwork Records and Phantom Carriage Brewery!